First off, thank you so much for all the kind words about the game, I’m really happy that so many people seem to like it. Second, since so many people seem to like it, I’ve given the game a much needed update based on the comments I received. Biggest change in the new version (1.1) is time trials. Once you get a three star ranking on a level you can also strive for the best time. Other changes include updated ui, difficulty tweaks, tighter controls, lots of tweaking, and bug fixes. Oh and there’s replays too, so you can show your friends your awesome time attacks. The compo page for both the old and the new version is available here: A Super Mario Summary. I hope you enjoy the new features! Results of Swedish LD gathering! Didn’t have time to post an announcement yesterday as my internet broke down whilst trying to submit. (The horror!) But it eventually worked again so without further ado, here is A Super Mario Summary! The game is a puzzle platformer containing the essence of every level in Super Mario Brothers game, in tiny single screen versions. Try aceing all 36 levels by getting all coins and jumping to the top of the flag pole! One of the main reasons I like to jam solo is the ability to swap between disciplines. If I were to code for 48 hours I would surly burn out pretty quickly but as long as I can swap from coding to pixeling to level designing to making sounds, I can stay on top. Just got tired of coding and decided to make a title screen. What can it be? I’m making a platformer (as usual) with AS3 (as usual) and finally putting my engine Pixelizer to the test! Working relly well so far. Woke up early today and decided to redraw yesterday’s graphical efforts. The result is a much more cheerful version of something I am sure you recognize. I’m quite happy with yesterday’s progress. 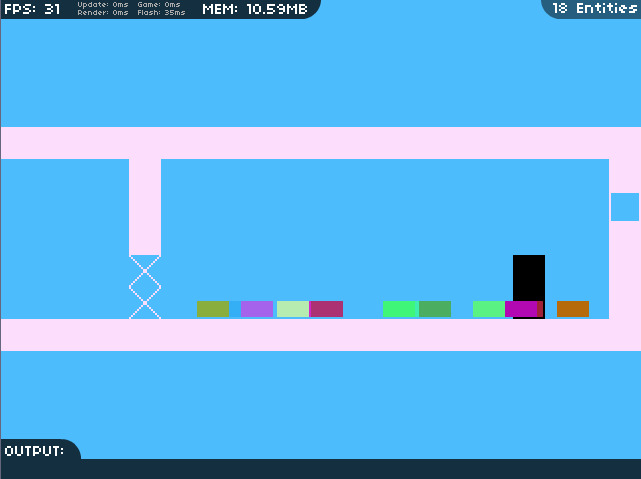 The game is basically done (save a few enemies) so I can spend the entire day on making levels and polishing. Biggest problem yesterday was eating too late too fast. Oh well. Here’s my warm up entry Bee’s Knees Bees! Was quite fun to make and is weird to play. Help the bees collect nectar and make honey, watch out for the bear! Pixelizer updated and on GitHub! What framework are you going to use for LD23? Why not try Pixelizer? Pixelizer is an AS3 entity and component based game framework and today I pushed version 0.4.2. This version holds mostly fixes and tweaks to the 0.4.0 version, but a few new things as well, e.g. visualising colliders. In order to make it easy and fast to use I’ve written a lot of components already so it should be super easy to get started. The whole thing also comes with a lot of examples that show you how to work with components. Read all about Pixelizer here. I’ll also take the opportunity to say that Pixelizer is now on GitHub. Join the fun! We’ve just decided that we ( Free Lunch Design ) will try to host an LD meet up during LD23! Join us at our office to jam, solo, or just hang out! Located in central Göteborg close to Järntorget we offer nice people, great restaurants, and lots of fun! Can’t promise we’ll be open 24/7, but we’ll try! Although our offices are spacious, we do have a limited number of seats so I cannot promise that everybody can come. But if you’re interested, drop me a line on @johanpeitz . I’ll be back with more details as the date closes in. See you then! Progress has been good and I am happy to announce Pixelizer 0.4! As it stands now it is mostly functional complete. What is Pixelizer? Pixelizer is a component based game engine/framework for making games in AS3. 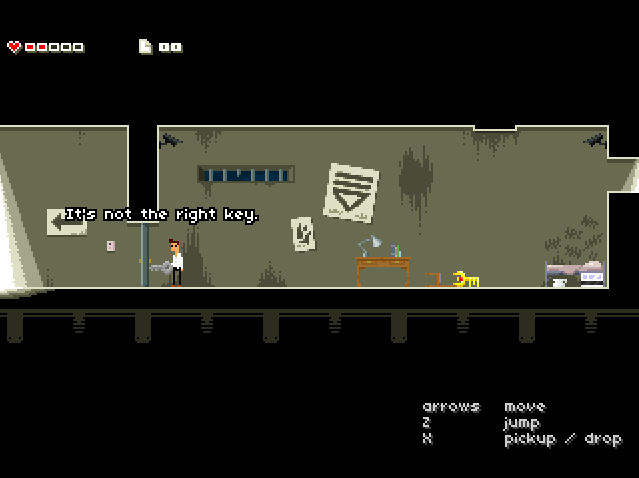 Think about it as Flixel/FlashPunk but with component. Easy to use and easy to extend. Comes with a truckload of examples too. As always, feedback, requests, and general encouragement is greatly appreciated! Thanks! First and last game from me this mini LD. Wasn’t really planning to make a pile so that’s O K.
But here it is! Circus 200! Help the acrobats build human towers through all the acts. Can you reach the finale?!?! Decided to also make it for that pirate kart thing so I went with a retro wide pixel look. First, I want to thank for all the good feedback I got since last release. It’s been really helpful, so keep it coming! And if you have any thoughts, feedback, or ideas. Let me know! Thanks! Pixelizer is a component based framework for writing games in AS3. That means that you have base entities and that you write little behaviors for them. Behaviors can be anything from game logic to rendering to whatever you can imagine. As most standard behaviors are already in the package, it is very easy to get started and getting your game on to the screen should be a breeze. I am aiming to make it really flexible, reusable and extendable. The main rendering technique in Pixelizer is currently blitting. Blitting is a fast way of displaying hundreds of objects with virtually no slow down. I’ve been inspired by Unity3D, Flash Punk, and Flixel and added a my own philosophy into it all. Code, example, and even a demo on the project page. I would very much appreciate feedback on the whole thing. Very much! Thanks! But nothing has happened since. Totally blank atm. I’m in! And here’s my game dev framework! Unless xmas prep explodes in my face or something I’m going to make a stab at the oncoming LD! Last few times I joined I used other peoples tools (flixel, flashpunk, etc) and wasn’t really happy with the decision. Mostly because they weren’t my own and that I had never used them before. So this time I want to use my own code and am therefore releasing it so that anyone can use it freely. It’s called Pixelizer and is an AS3 component based game framework that mosly works with sprite sheets and platformers. If anyone is interested to use it, it is available here. Again my weapon of choice was AS3 and low res pixel graphics. This time I tried out FlashPunk (thanks to Sos’s framework posted earlier) and even if I used very little FP code I was quite happy with my choice. I wanted to really put the player into the action and let the player imagine what had happened before for herself. This had could been done a lot better and I’m not happy with the intro and outro texts at all. They worked, but nothing more. I think better texts could have emphasized the point of the game and the players’ reactions even more. I hadn’t used FP before so when I found out that Sos had posted a quick and dirty platformer framework I decided to use it right away. The framework was good for most parts (thanks Sos!) but there where some minor glitches that stopped me from adding some of the polish I wanted in the end. Since there is so little platforming actually in the game I might have been better off writing it from scratch. I tried to think of a third thing that didn’t work out but failed. I didn’t eat very much, but that was expected. Next time I really should take more breaks and eat better – pomodoro style! Knowing that I wouldn’t be able to pull any all nighters I decided to try something very special and short instead of generic and large. Usually I want to make levels after level, but this time I was smart enough to realize my weaknesses and use them as strengths. While I usually dabble with pixel graphics, I wanted to try a new style this time. Normally I’m very much about child-like proportions, big eyes, and black outlines. In BATHOS I aimed for a realistic style in order to make it feel more real. Wether I actually achieved the latter or not, I’m very happy with the looks of the game and it is something that I will surely use again. Although there were some minor kinks in the framework I used on top of FlashPunk it allowed me to dive straight into the game mechanics. This saved me a lot of time and I think it was the first time in many years that I didn’t write any engine code for a game. Big thanks to Sos and Chevy! Reading the initial response I am very happy with positive comments, something which I am very grateful for. There are of course people who don’t like the game and/or hate the ending, which it why I named it BATHOS ( = anti-climax ). And that’s it! I’m really loking forward to try the entries of this LD, a lot of great looking entries. Extra kudos to Phil and PoV for putting in the extra time and effort to keep the site running – thanks a million! 36 queries executed in 0.125 seconds.